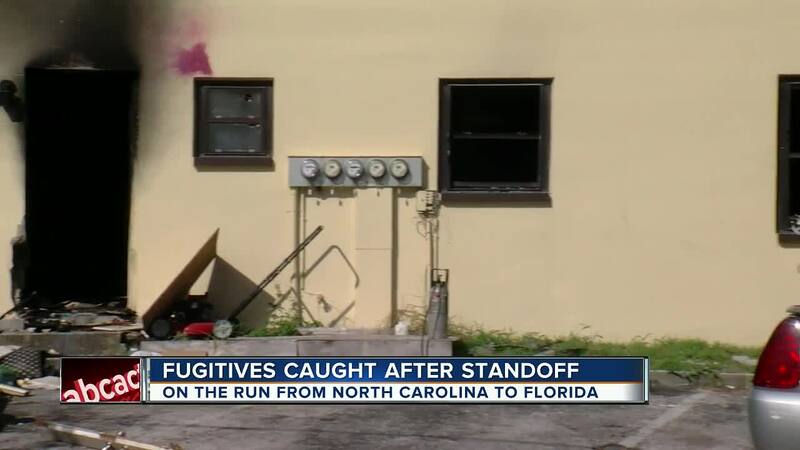 TREASURE ISLAND, Fla. -- Two fugitives from North Carolina were arrested in Treasure Island after one of the men held off sheriff's deputies and set fire to the apartment where they were staying, officials said. Arrested were 26-year-old Alton Smoot of Thurman, N.C., and 50-year-old Donald "Alfred" Billings of Sparta, N.C., in the 9900 block of Gulf Boulevard in Treasure Island, the Pinellas County Sheriff's Office said. The men were wanted on fugitive warrants from Alleghany County, N.C. for shooting at law enforcement officers. "These guys are bad people, and they were engaged in activity where they were willing to shoot it out with a cop," Pinellas County Sheriff Bob Gualtieri said. "We are very fortunate that no one was hurt and no law enforcement were hurt." Pinellas County sherif's detectives took Smoot into custody about noon Saturday. Billings was arrested about 12:45 a.m. Sunday after a several hour standoff with law enforcement. Billings was then flown to Tampa General Hospital for treatment of burn injuries. The incident that led to the men's arrest began about 11:35 p.m. August 11 in Alleghany County, N.C., a Pinellas County Sheriff's Office news release said. Alleghany County sheriff's deputies in North Carolina tried to make a traffic stop on a 2001 Toyota Tundra registered to Billings. The truck sped away with deputies in pursuit. Alleghany County deputies reported Billings and Smoot shot at them from the truck using a handgun and an AR-15 rifle. Alleghany County deputies broke off the pursuit and no deputies were injured. Billings later abandoned the Toyota Tundra and stole a Chevrolet Tahoe, the release said. Warrants were issued for both men's arrests in North Carolina. On Friday, August 17, members of the U.S. Marshal's Service notified Pinellas County sheriff's detectives of the likelihood Billings and Smoot were in Pinellas County. Detectives learned Billings had an ex-girlfriend who lives in Treasure Island. On Saturday, August 18., Pinellas detectives conducted surveillance in the area of the ex-girlfriend's apartment on Gulf Boulevard. Smoot was spotted and arrested. During the investigation, detectives learned Billings was inside the apartment with a machete, a handgun, a 223 caliber AR-15 rifle and a pipe bomb. Witnesses told detectives Billings specifically stated he was not going to go back to prison and would shoot it out with police before shooting himself, the release said. Detectives also learned Billings had made a pipe bomb using black powder, metal and a detonator cord. Members of Pinellas County sheriff's SWAT were called out to try to establish communication with Billings. After the SWAT's efforts were unsuccessful, they used tear gas to flush Billings out of the apartment, but he refused. Deputies breached the doors of the apartment and used flash bangs. But before SWAT members could enter the apartment, a fire broke out and firefighters were called to extinguished the flames. Deputies then entered the apartment and found Billings lying on the floor with two AR-15 magazines in his pocket. Billings was found alive with severe burns, the release said. Billings was charged with warrants out of Alleghany County, N.C., for one count of attempted first degree murder on law enforcement, one count of felony conspiracy to commit first degree murder on law enforcement, and possession of firearm by felon. Smoot was taken to the Pinellas County Jail to face charges of warrants out of Alleghany County, N.C., for one count of attempted first degree murder on law enforcement, one count of felony conspiracy to commit first degree murder on law enforcement, one count of aggravated assault with gun, one count of aggravated assault with a weapon, and one count of fleeing and eluding law enforcement. Smoot has a first court appearance scheduled for 1 p.m. Monday in Pinellas County.